Arbib Heritage & Nature Trail, popular with many. . . This photo is of the Whim Adventure section of the ARBIB HERITAGE & NATURE TRAIL, and is for the more adventurous, sure footed hikers. Scrambling over boulders and walking upon uneven surfaces all the way is the order of the day. This award winning trail was developed by the Barbados National Trust, with the financial support of Sir Martyn Arbib, an English entrepreneur. 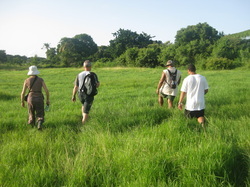 On this trail we showcase Barbadian architecture, local flora and fauna, as well as chat with residents in the Whim Village. It's suitable for families, and ages have ranged from 5 to 85 years old to date. It's a popular trail with the E grade Ramblers of UK, with whom we have worked for many seasons. 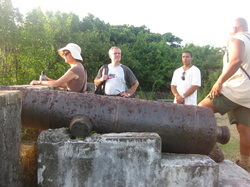 Hikers relaxing at the Old Dover Fort and Signal Station, overlooking Northern Speightstown.This was one in a series of Signal Stations employed during the 1800s to communicate across the island. This vantage point overlooks one of the island's largest Amerindian Settlement Sites,which was prized real estate over 1500 years ago, and is still so today.